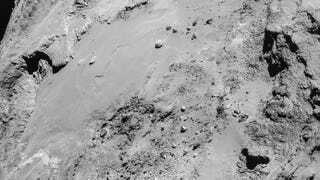 The Rosetta probe has been consistently blowing our puny little minds with photos beamed back from Comet 67P/Churyumov-Gerasimenko, but these new photos, taken as Rosetta conducted a low-altitude flyby, give a whole new perspective. As 67P gets close to the Sun (close in space terms: it's still over 200 million miles away), it's heating up and becoming more active. Up until now, Rosetta has been in orbit around 67P, but thanks to the increased activity, the ESA retasked it with a series of flybys — some at low speed from a long distance, and others fast and close. On Valentine's Day, Rosetta buzzed by just 8.9km from the surface. Flybys allow Rosetta's instruments to sample the lower reaches of the comet's environment, and thanks to the better lighting conditions, also provide some incredible photos. The full collection, along with a more complete write-up of the mission, is over on the ESA blog.